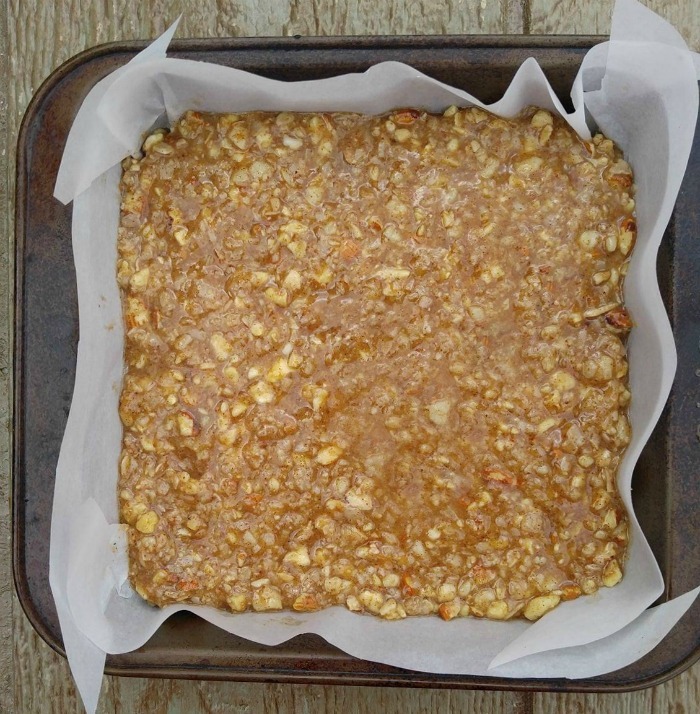 Looking for a grab and go breakfast recipe or a snack to enjoy after a workout? Try these chocolate nut granola bars. These bars are soft and chewy and have just a touch of sweetness that pairs well with the crunch from the nuts. Making these Chocolate Nut Granola Bars is so easy! 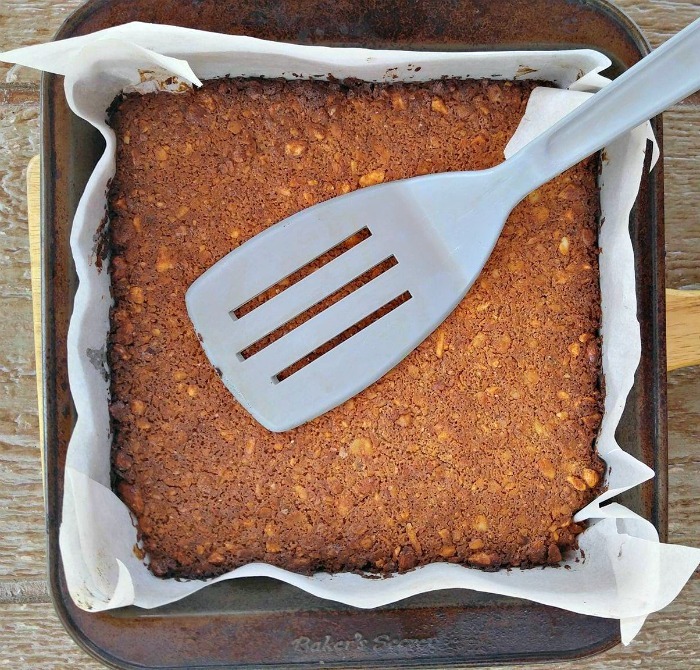 I used a food processor to make these bars in a flash. 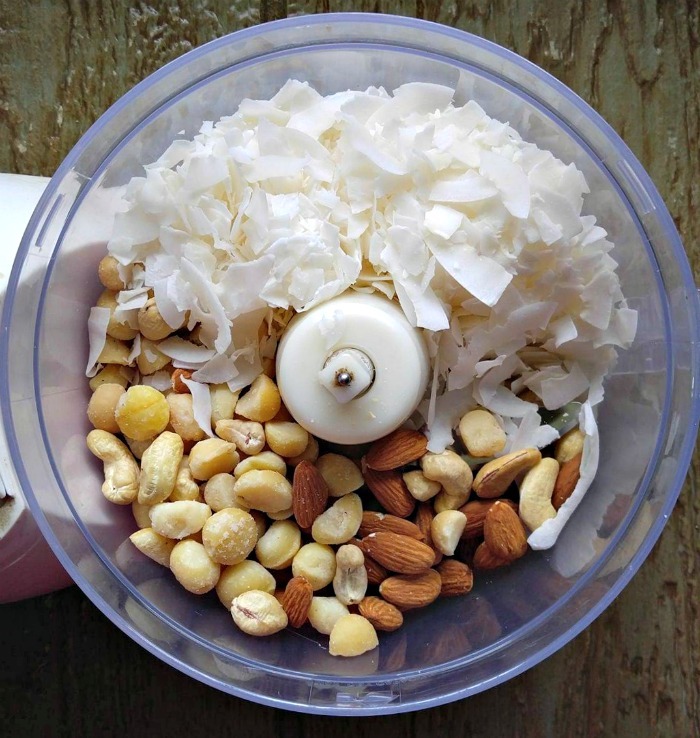 Just dump the nuts and flaked coconut into the processor and give it a few pulses until the nuts and roughly and fairly evenly chopped and the coconut has mixed well. Another few pulses will mix in the cinnamon, almond flour and sea salt. And voila! The bars are ready to get sticky! I used honey, almond flour and coconut oil to give the nut mixture something to hold onto. A few seconds in the microwave is all it took. Then, add your egg and give it a good stir to make a nice, smooth mixture. Pour the honey mixture over the nut and coconuts and you are almost done. Don’t you just love quick and easy recipes? The mixture will be very sticky. Just pour it into a prepared pan and press down to make sure it is even. Bake for about 30 minutes until the mixture is lightly browned and feels quite firm.. While the bars are cooling and firming up you can heat the dark chocolate in the microwave until smooth.. Place in an icing bag and drizzle over the cooled bars. Easy, peasy!! If you are looking for a wholesome, soft and chewy granola bar, you can’t go wrong with these. They don’t have a super sugar content but are still satisfying. I’ve been following a Whole30 plan for the last few months and this is a nice way to ease back into sugar without waking my sugar dragon up! These chocolate nut granola bars have a nutty taste that blends with the honey and almond butter beautifully to make a super tasty snack, pick me up treat, or quick breakfast. The dark chocolate drizzle gives them a dessert like feel and they are so darned good! 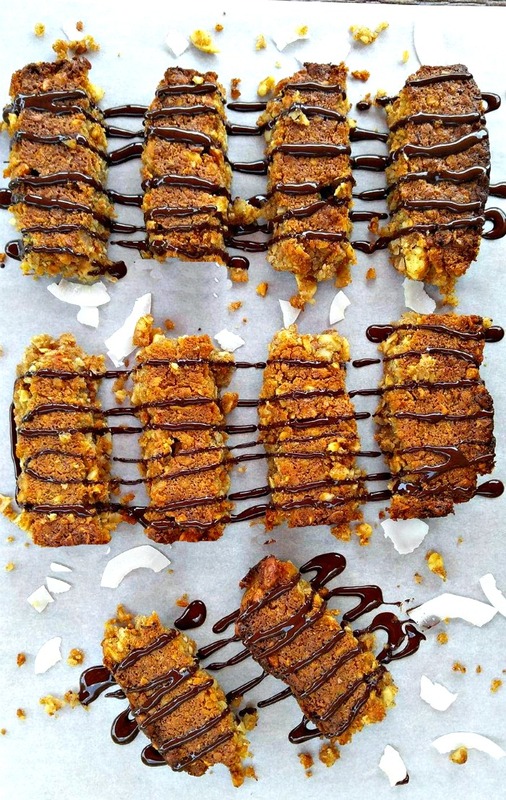 These delicious bars are a clean eating treat. They are gluten free, dairy free and Paleo. Why not make some today? You’ll be glad you did! 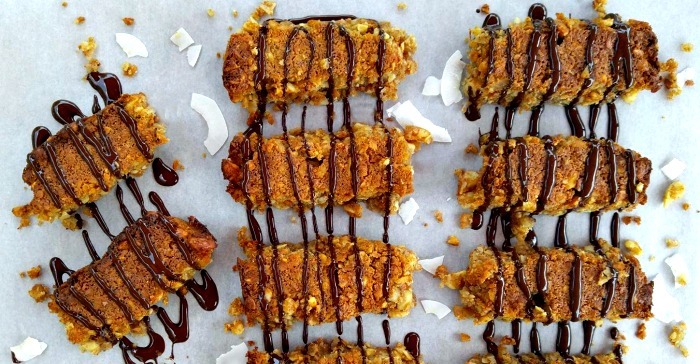 Try these chocolate nut granola bars. They are soft and chewy and have just a touch of sweetness that pairs well with the crunch from the nuts. Preheat the oven to 350° and line an 8×8 pan with parchment paper. 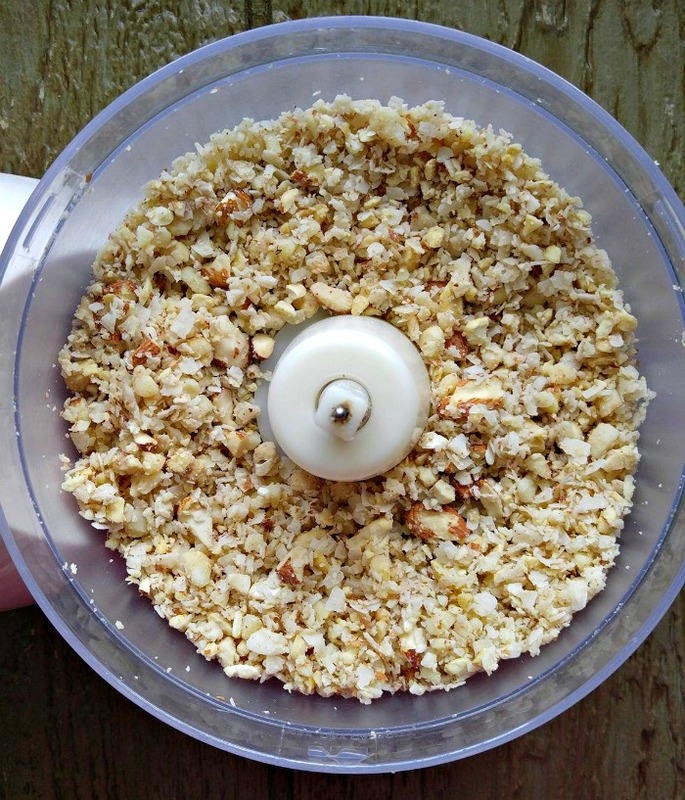 Pace the nuts, and flaked coconut in a food processor and pulse until roughly chopped. Add the cinnamon, sea salt, and almond flour and pulse a few seconds more. 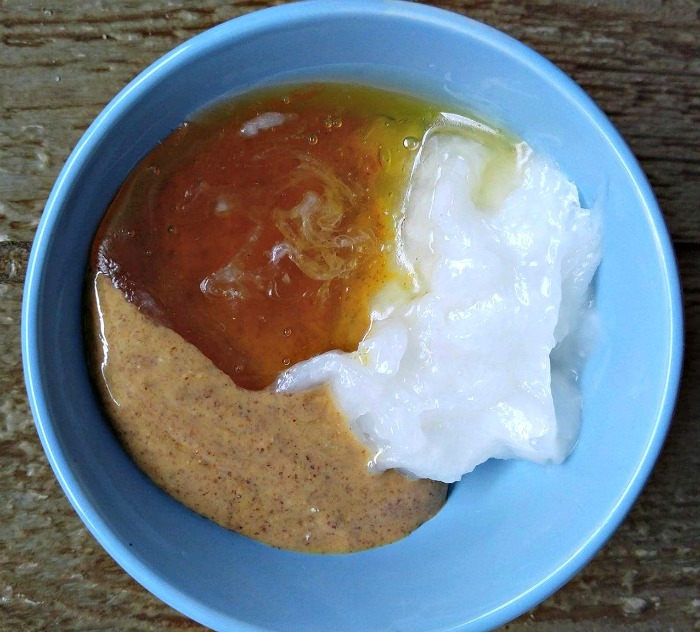 In a separate bowl, mix together the coconut oil, honey, and almond butter. Place in the microwave for 10-20 seconds and stir till smooth. Add the egg and mix well. 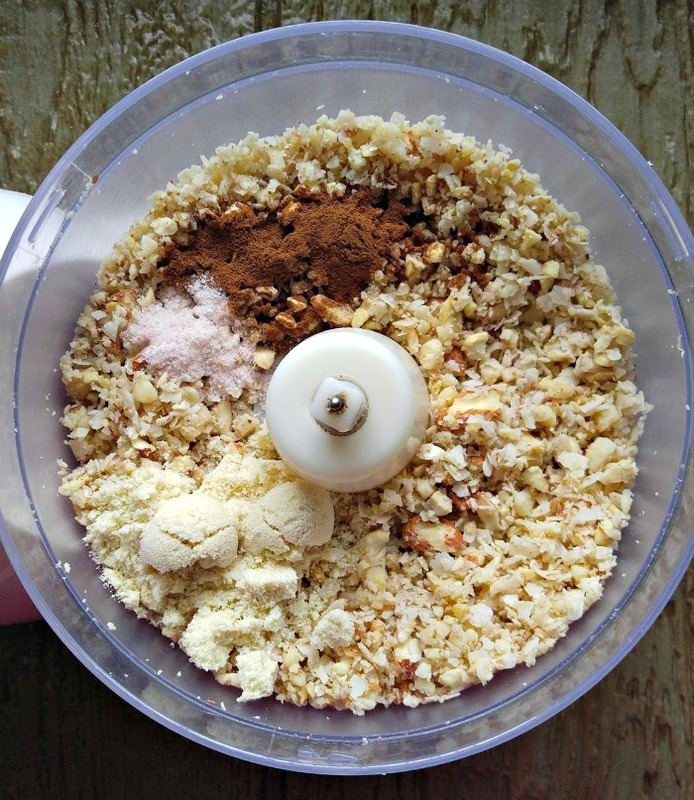 Pour the coconut oil mixture over the dry ingredients and mix until fully incorporated. Place the mixture into the prepared pan and press down until it is very even. Bake for 28-30 minutes, until the mixture is lightly browned. Remove from the oven and press down again using a spatula. Cool completely and then cut into 10 bars with a sharp knife. Melt the dark chocolate in the microwave in 10 second intervals until smooth. Place in an icing bag and drizzle over the bars.